New Zealand sits right in the cross hairs of the Roaring Forties, leaving it exposed to the rolling swell that boils up from turbulent Antarctic storms. New Zealand’s tiny land mass with vast stretches of epic coastline has made it somewhat of a surfer’s paradise - minus the constant warm weather and coconut trees! 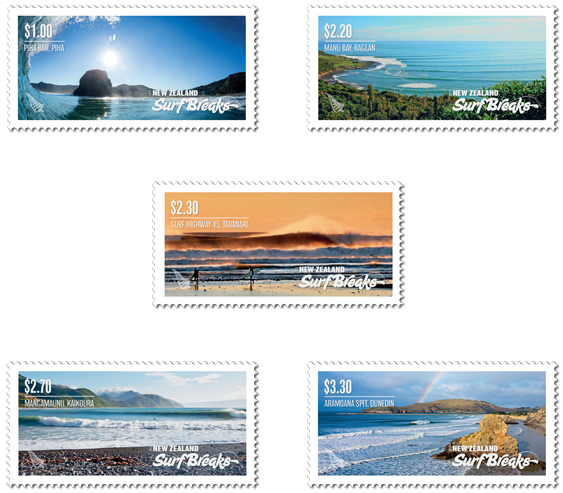 The New Zealand Surf Breaks stamp issue takes a look at some of New Zealand’s most popular surf breaks - from the long peeling waves at Piha to the frigid waters along the Dunedin coast. Each of the five stamps in this issue features one of New Zealand’s prime surfing spots, with dramatic images captured by some of New Zealand’s top surf photographers. The North Island is represented by two of New Zealand’s most well-known surf spots, Piha Bar in Piha and Manu Bay in Raglan, as well as the Waiwhakaiho River mouth in Taranaki along Surf Highway 45. The South Island is represented by Mangamaunu in Kaikoura and Aramoana Spit in Dunedin, both producing world-class breaks in the cooler southern waters. $1.00 - Piha Bar, Piha. Piha Bar is at the south end of South Piha Beach west of Auckland. 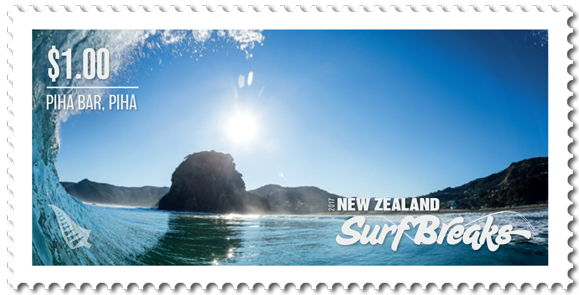 Piha is the birthplace of modern New Zealand surfing. The infamous Piha [sand] Bar is a fickle beast. Sand will build up in the southern lee of the bay along Taitomo island, this can create long peeling waves. Photo credit to Craig Levers. $2.20 - Manu Bay, Raglan. 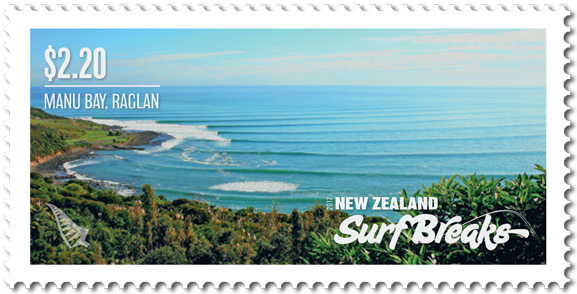 Raglan is New Zealand’s international surf mecca. Being the closest west coast settlement to Hamilton the discovery of its three rocky left-hand point breaks was inevitable. Manu Bay is arguably the nation's most consistent surf break, on any given day of the year there will be a rideable wave. 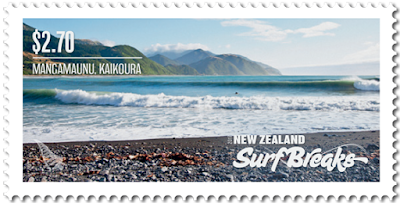 If the swell is too small, Wainui beach just to the north or Ruapuke Beach to the south will have a wave. Photo credit to Jwan Maliek. $2.30 - Surf Highway 45, Taranaki. 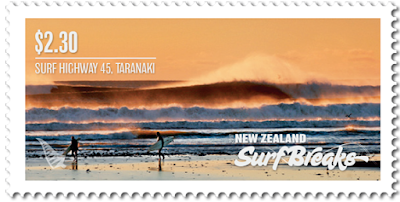 Surfing is so engrained in Taranaki they named their main regional road The Surf Highway. And it is no exaggeration; there are surf breaks everywhere. The Waiwhakaiho river mouth is just to the north of Fitzroy Beach, known as Waiseys by the locals. As a general rule, it's a fun A frame-shaped peak. The right-hander peels back into the river mouth and is more consistent than the left-hander. Situated on State Highway 1, just 15 minutes up the road from the Kaikoura township, Manga’s is perhaps New Zealand's most iconic right-hand point breaks. 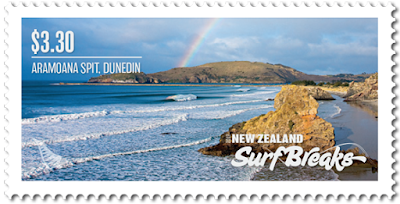 It is on every Kiwi surfer's bucket list. After the 2016 Kaikoura earthquakes, the sea bottom at Manga's raised 2.5 metres. Many feared an icon of the coast was lost. But waves still peel down the point for over 300 metres, and new surf breaks have been formed. Photo credit to Warren Hawke. $3.30 - Aramoana Spit, Dunedin. The Otago coastline is New Zealand's most surf-drenched. 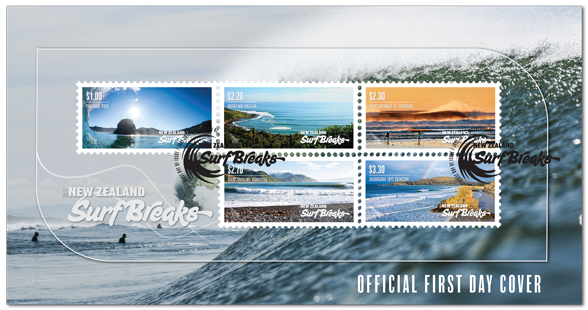 With world-class surf breaks at every turn. Aramoana Spit is one of Otago's prime jewels. Its beach produces world class waves due to the offshore outer sand banks. These break up incoming walls of swell into perfect A frame peaks that pitch onto the shallow inshore banks. Photo credit to Silas Hansen. 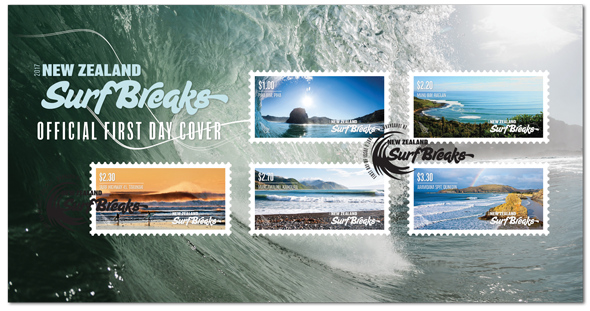 Miniature Sheet First Day Cover. 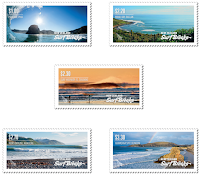 Unless stocks are exhausted earlier, these stamps will remain on sale until 6 June 2018. First-day covers will remain on sale until 6 August 2017. 2005 Ross Dependency Through the Lens.